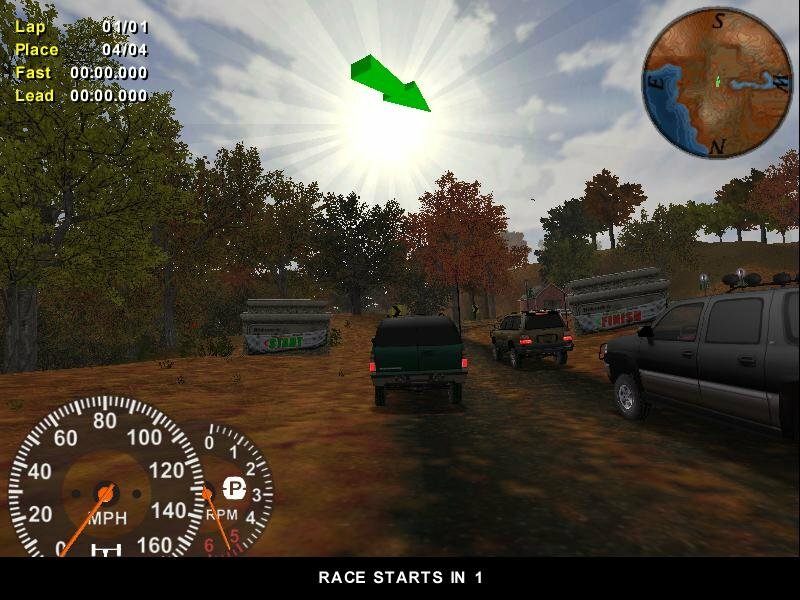 Off-road racing has a long tradition on the personal computer, including, for example, the Test Drive Off-Road series from Accolade / Infogrames, Off-Road Redneck Racing from Rage, and the Monster Truck Madness series from Microsoft. 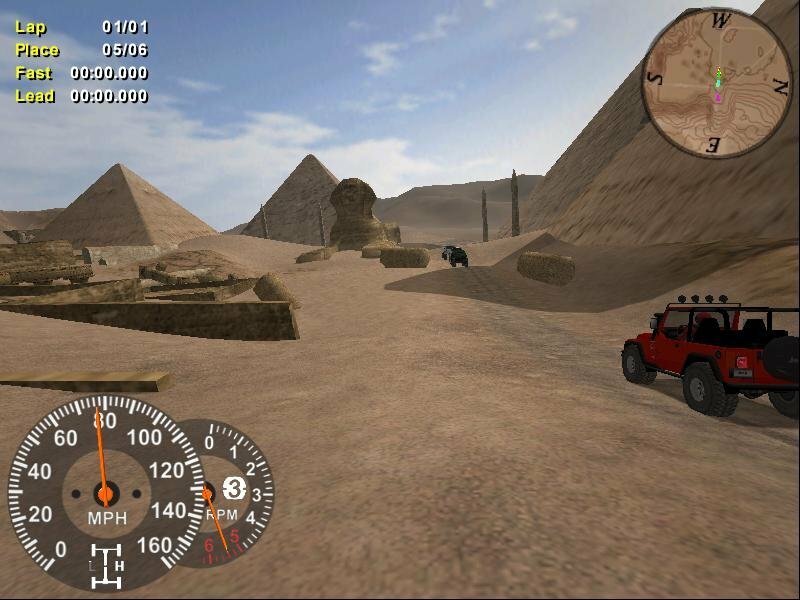 In 2000, developer Terminal Reality and publisher Gathering of Developers joined forces to release the arcade off-road racing title, 4X4 Evolution. 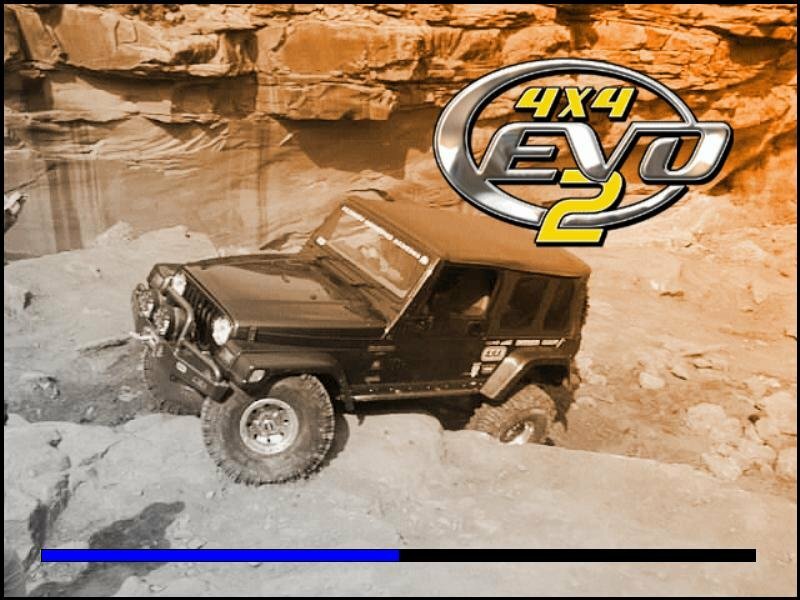 Now the two companies are combining their efforts to put out a sequel, 4X4 EVO 2. 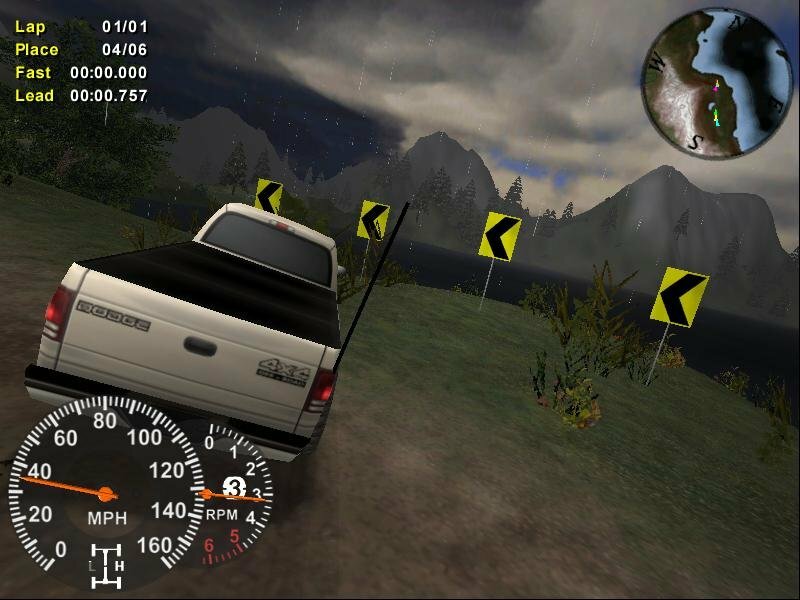 Here you get to compete in sports utility vehicles and light trucks in zany off-road racing out in the wild open country. 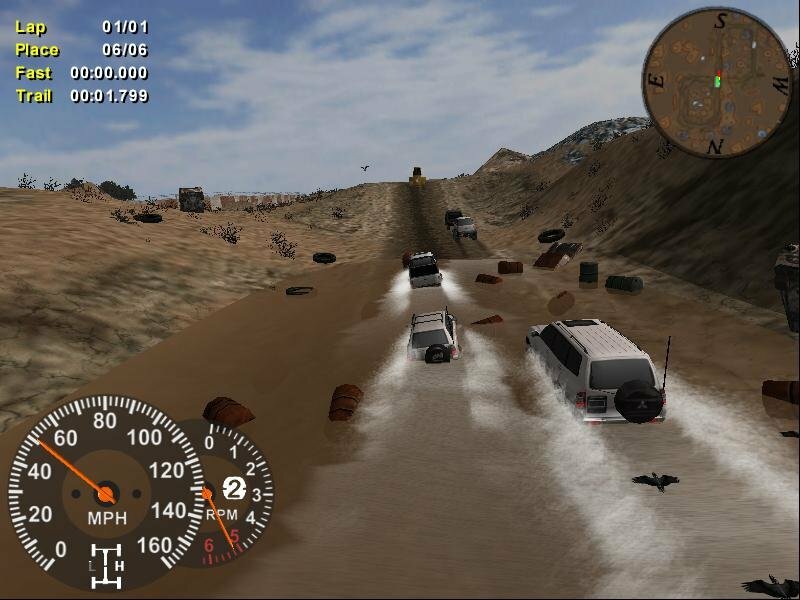 A good deal of expansive and multifaceted environments are present here, ranging from desert to snow, from a military installation to a super-highway, and from Egypt to Tibet. The length of each race varies but it can extend up to an exhausting twenty laps. 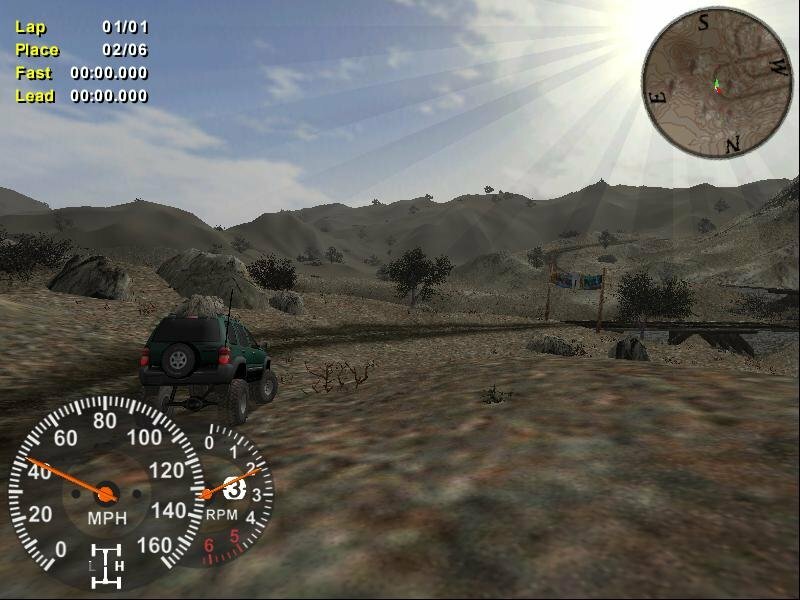 You are not alone when you drive, as you will encounter stray civilian vehicles along the way, although a lot of the areas you pass through are decidedly remote. 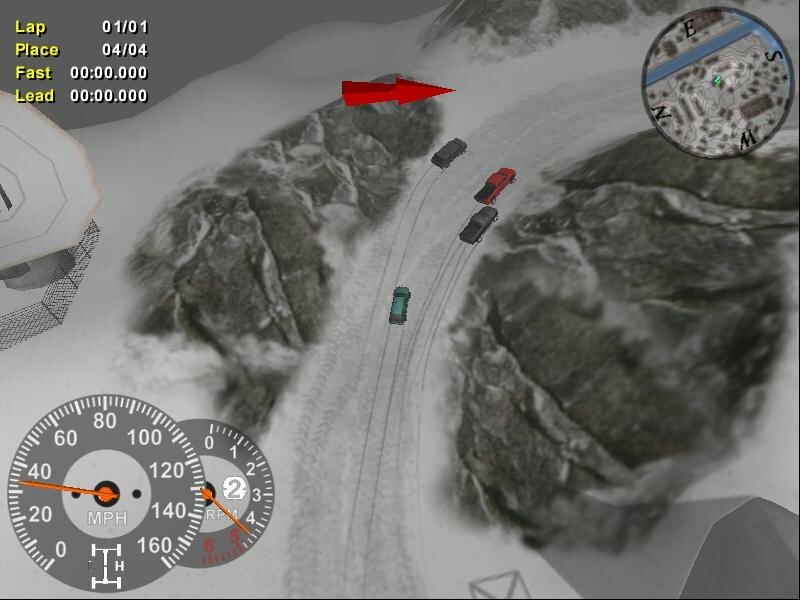 The challenges on each track differ markedly, for there is no redundancy whatsoever in the track design. The overall quality of the locales included is excellent, and the level of diversity is exceptional. 4×4 trucks or space patrol? You decide. 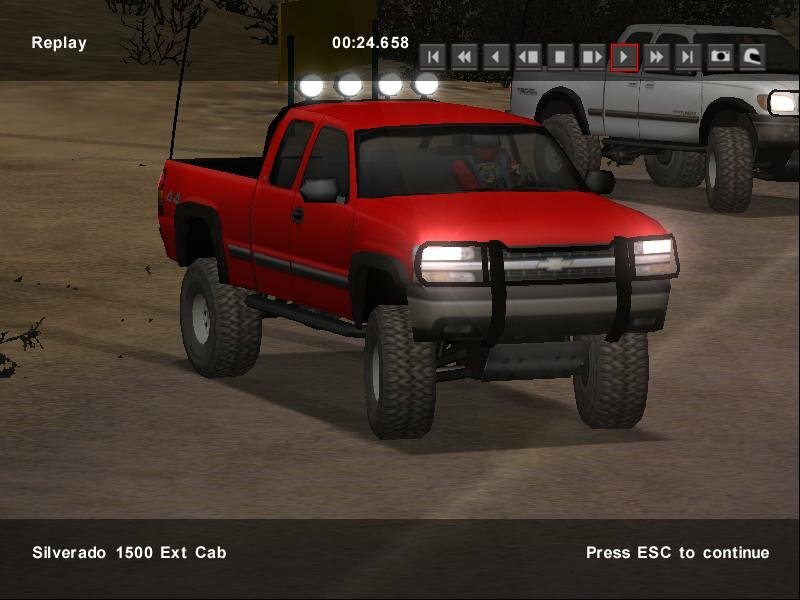 Similarly, there is a huge selection of vehicles in 4X4 EVO 2. 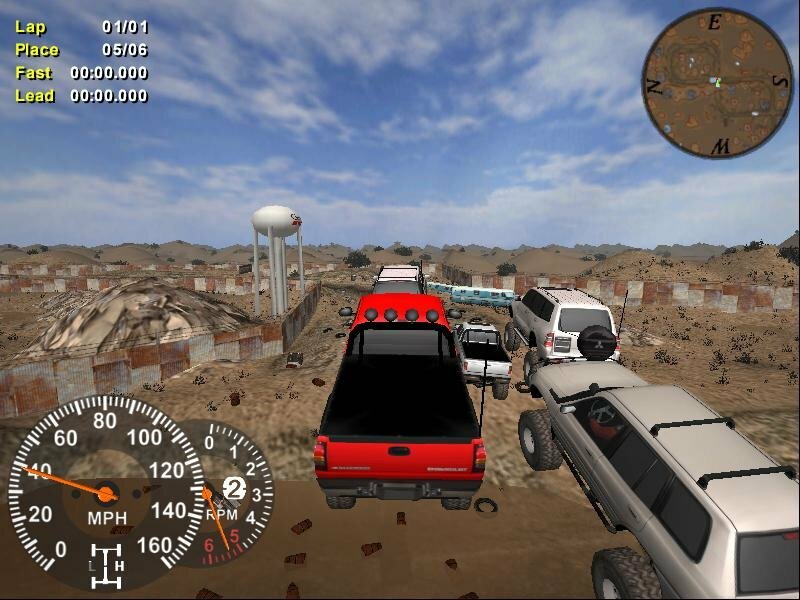 These include 120 models encompassing sport utility vehicles, light trucks, and monster trucks. 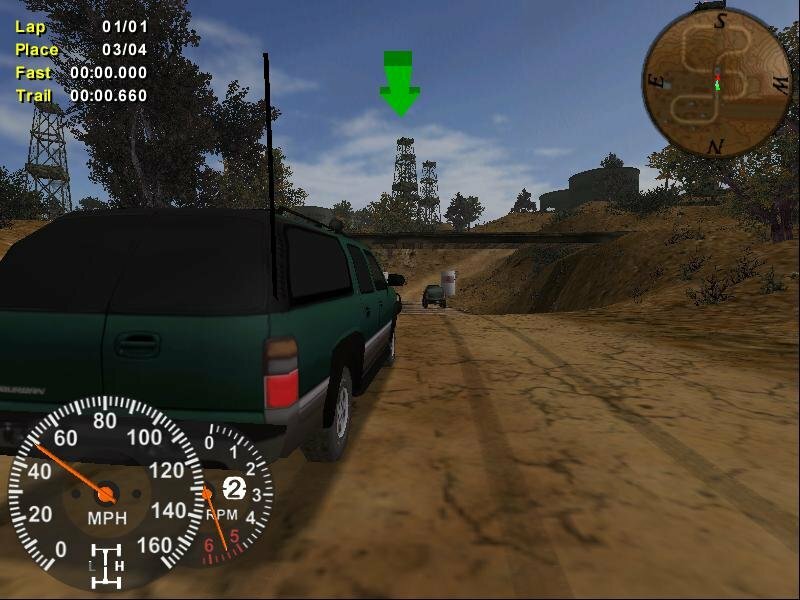 These range from unmodified cars to those with extensive enhancements specifically designed for off-road racing. The major brands are all here, including Chevrolet, Dodge, GMC, Jeep, Mitsubishi, Nissan, and Toyota. 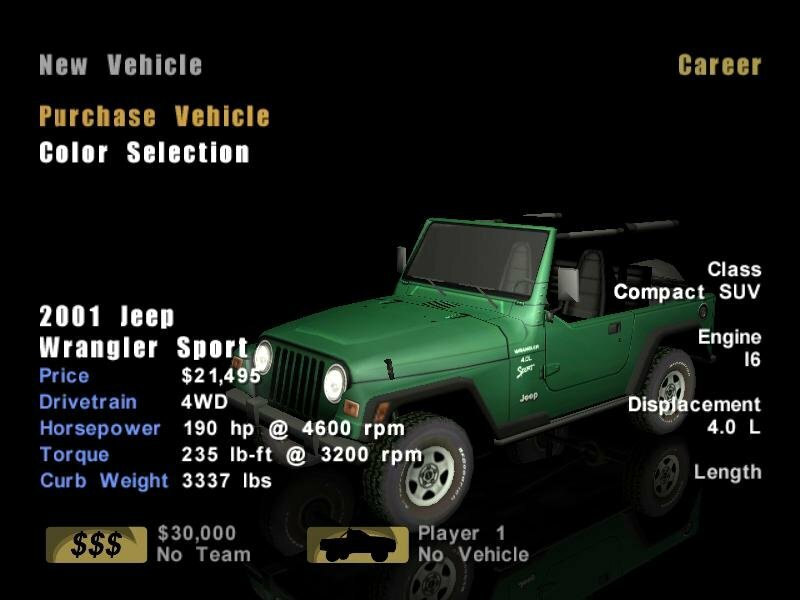 Over a hundred upgrades allow you to extensively customize your vehicles. Unfortunately, the range of choice is a bit deceptive, for not every vehicle has differentiated performance; indeed, it seems as if there are just a few distinct clusters of different types of handling characteristics. 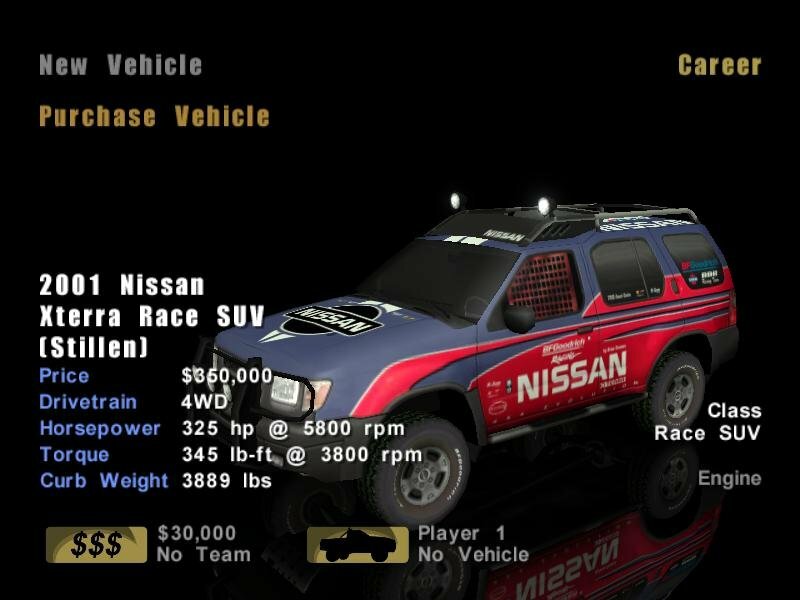 Your capacities to tweak your vehicle in 4X4 EVO 2 are diverse — an unusual quality for an arcade racing game — yet not nearly as vast as in many racing simulations. You may determine the type of tires, transmission, suspension, axle ratio, break balance, torque split and handling balance. 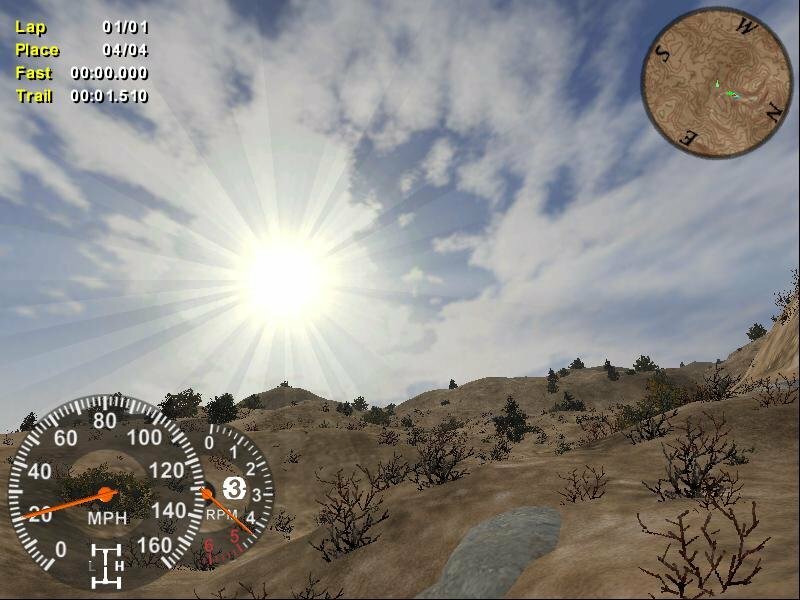 While each alteration has a marked impact on vehicle performance, tuning everything perfectly is not as essential to success as it is elsewhere in the virtual racing world. 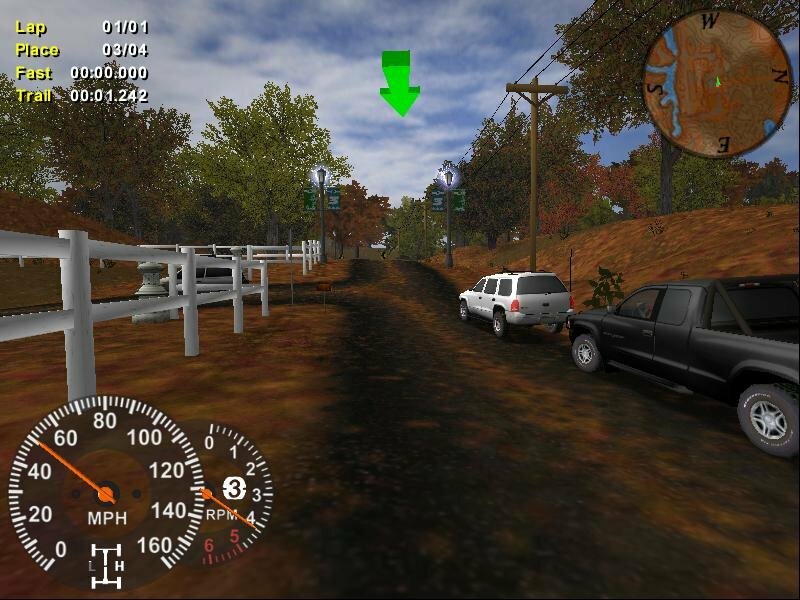 In addition, integrating your tuning decisions with your selections from the truly huge range of parts available is important to have a chance of winning. 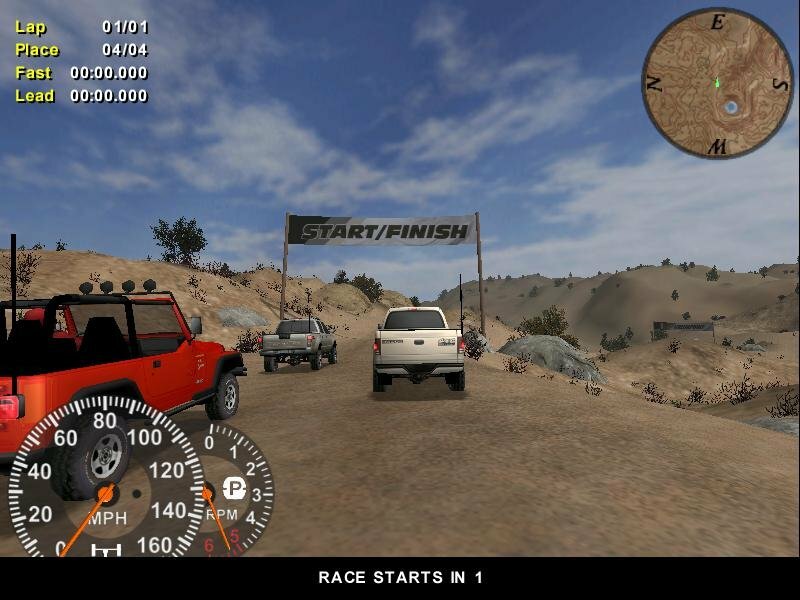 4X4 EVO 2 also has a wide range of single player racing modes. 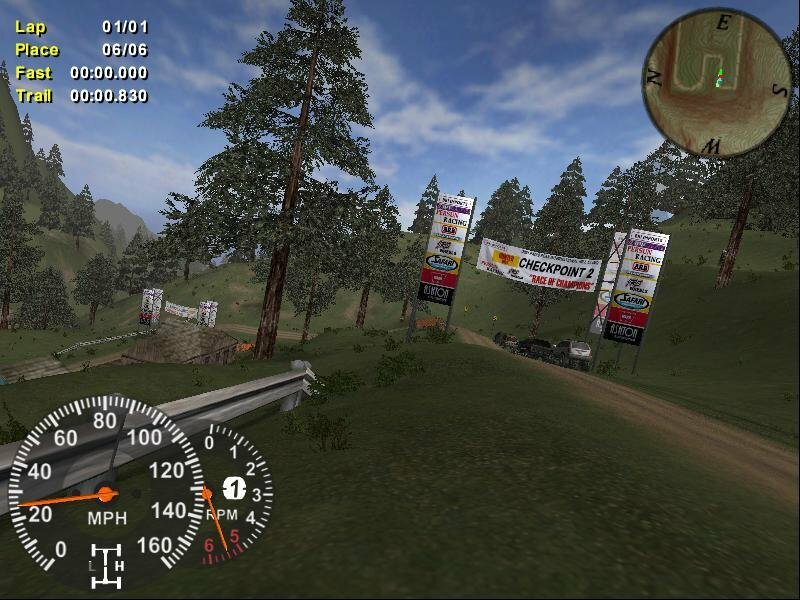 Quick Race and Time Attack are both standard fare, but the real heart of the racing experience occurs in career mode. 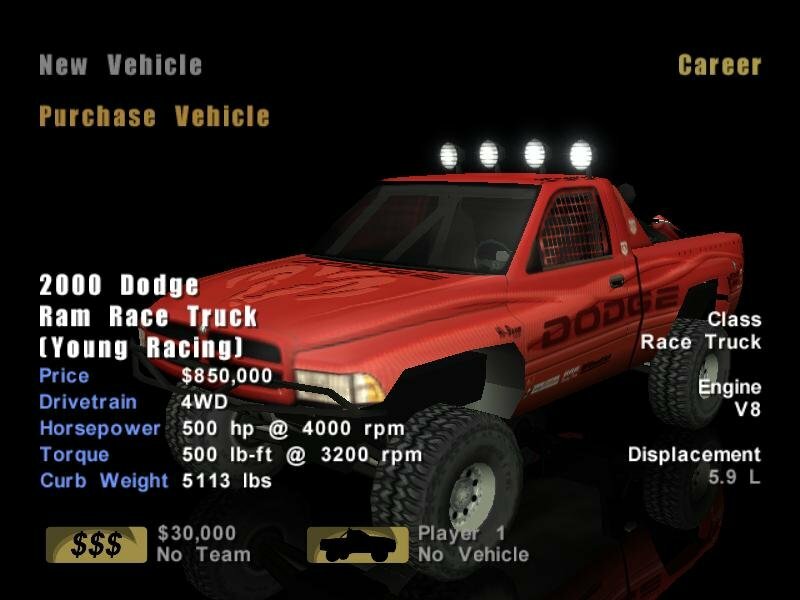 Here, you begin with no vehicle and a limited budget; then you buy a stock car and try to earn more cash; and finally you use your earnings to upgrade parts and better your vehicle, then sell high and buy an even better ride to win more races. 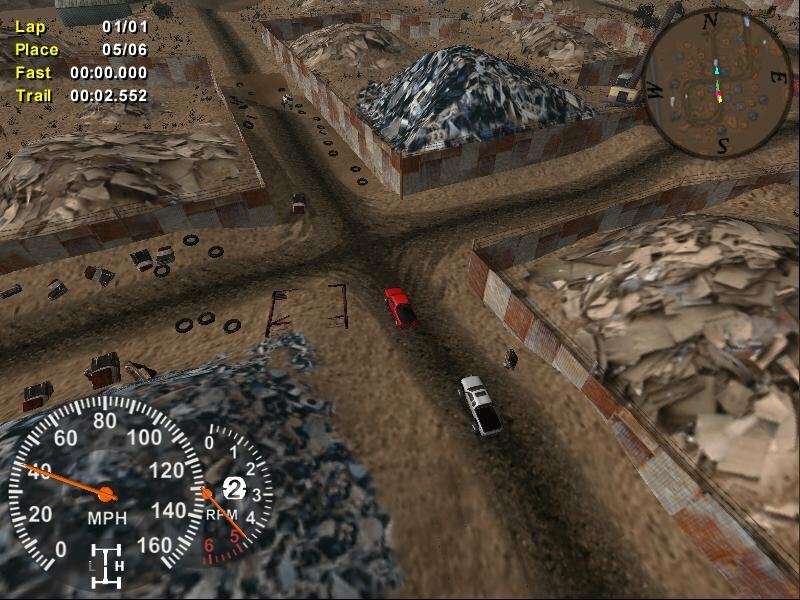 On the surface this sort of gameplay appears to be standard, but underneath lurks some originality, mostly in the form of ‘adventure missions’ involving various objectives that range from glorified postage to search-and-rescue. 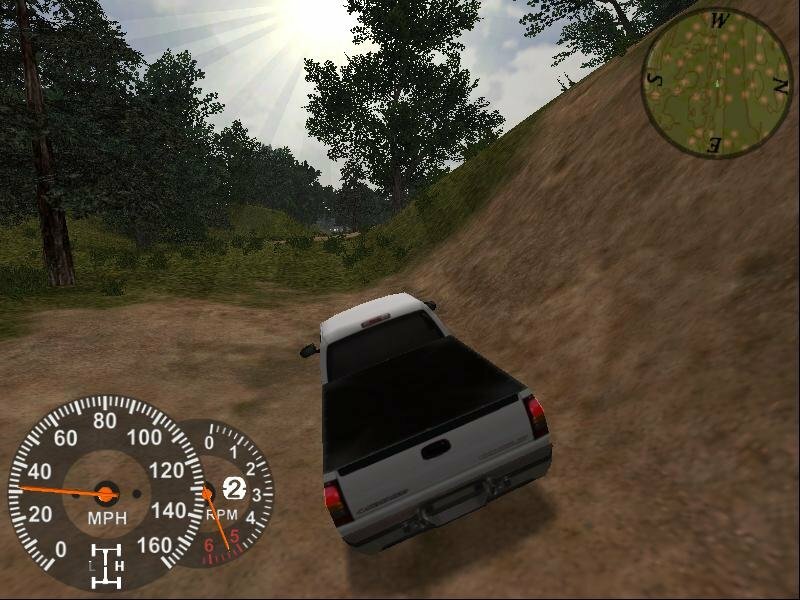 What’s more, you can actually explore these routes before committing to a race in ‘Free Roam’ mode, allowing you to get a better grip of each location. 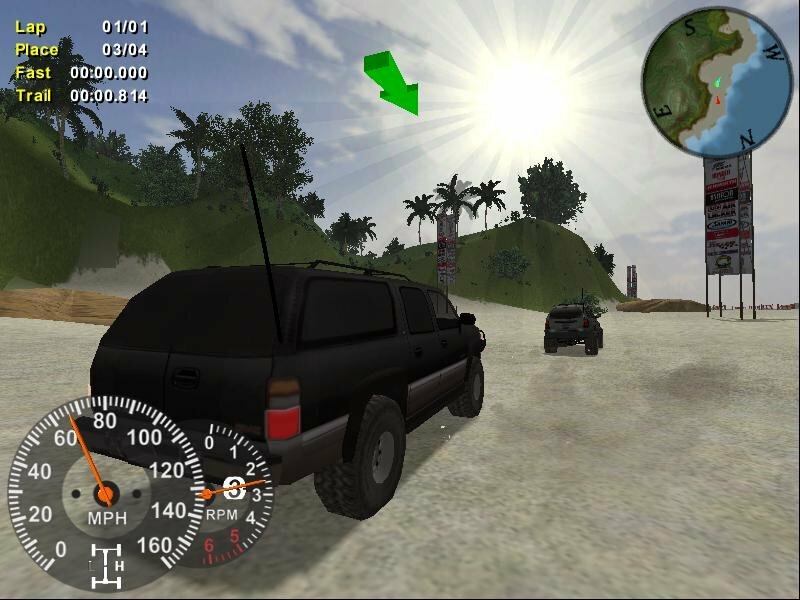 The most significant innovation in this sequel is the inclusion of “adventure missions.” At the start of each mission, you receive a briefing, a list of objectives, and a map, and every location contains hidden secrets. 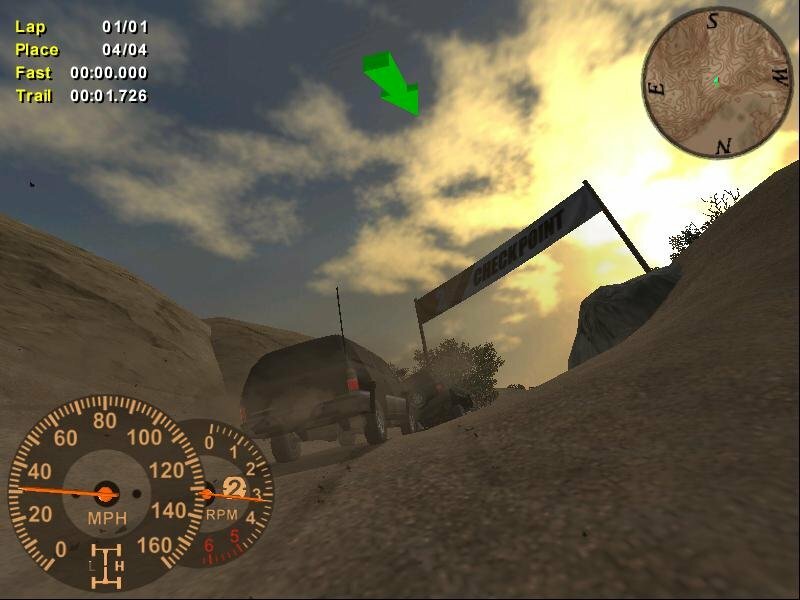 Completing a mission or discovering these secrets earns you cash for use elsewhere. These missions involve such goals as finding a particular structure or location, transporting supplies or documents to needy recipients, and performing search-and-rescue operations. 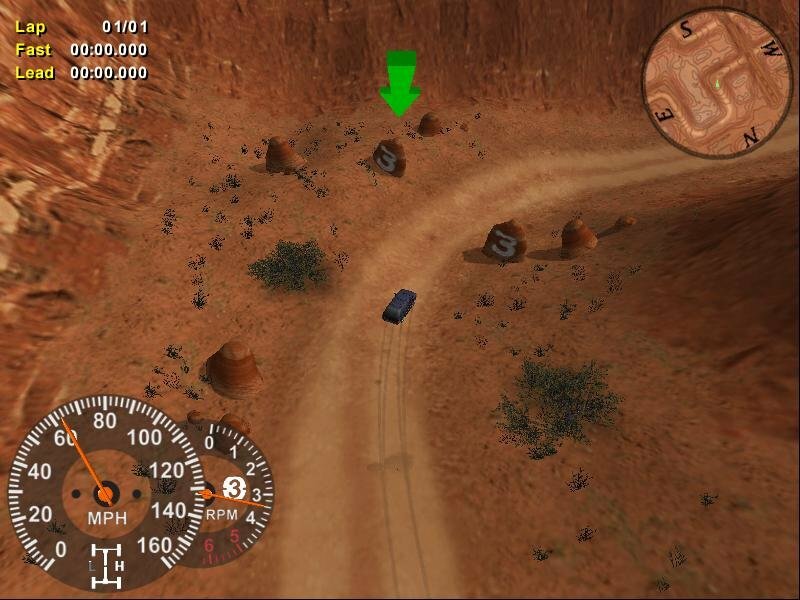 Although the premium in these quests is not placed on racing speed, the missions are really fun and contribute substantially to the value of this offering. 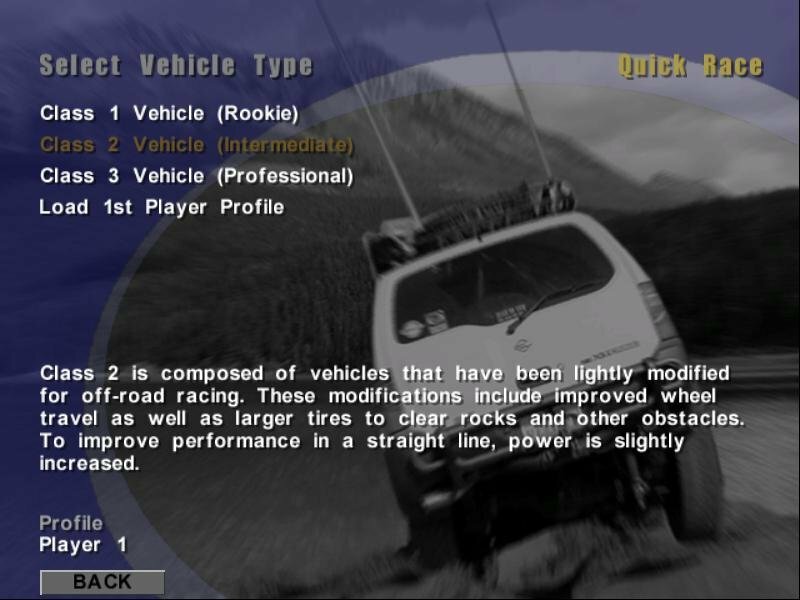 The single most disappointing facet of this release has to be the implementation of collisions, which occur with greater frequency in off-road racing than in traditional closed track racing because paths are littered with obstructions as well as with other vehicles. There is notable inconsistency here, as you can drive through some objects unscathed while others of roughly the same size stop you in your tracks. This can potentially ruin your race, but not your vehicle (considering the utter lack of any damage modelling). Finally, the impact of vehicle-to-vehicle collisions is erratic, and the driving AI isn’t far behind, with cars that bash into obstacles and each other haphazardly. 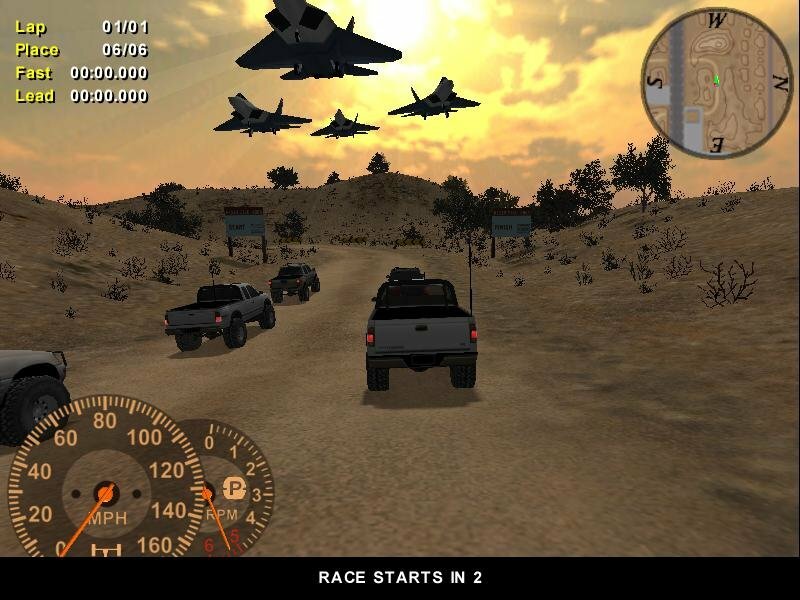 The game is fun, although my friends complained about the poor graphics when we played the lan mode, they where surprised to find out its from 2001… Thanks for sharing..